Sorry we haven't been around much lately but Mum has been busy and hasn't had a chance to visit all your lovely blogs. She hopes to catch up over the Easter weekend. If you celebrate Easter, then we wish you all a great one! I can't eat chocolate of course, because I'm a cat and it's bad for me, but Mum is very much looking forward to devouring this tomorrow. It's a vegan chocolate Easter egg from Moo Free. All dairy free but she tells me it's lovely. But of course it's a no no for me because I'm a cat. Never mind, I'm sure she'll give me a cat treat or two. 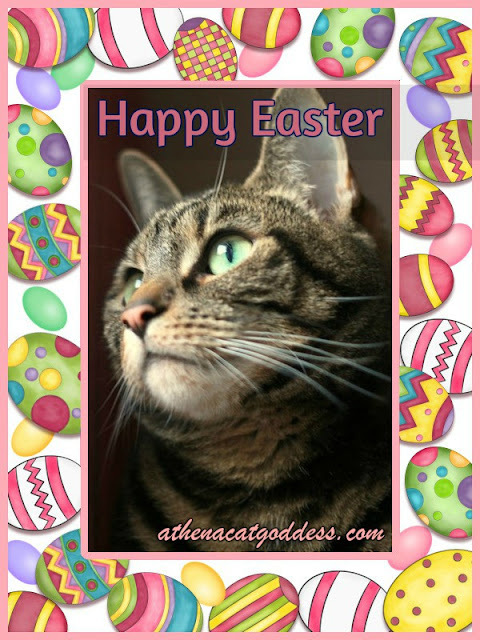 I hope your Easter is fun, Athena - I love your festive frame! Very nice and useful Easter card ! Happy Easter ! Hippity Hoppity Happy: such sweet and colorful art, we love it! Happy Easter! We love your card! Mommy is looking forward to Blueberry Bread Pudding, she says that is bad for us too. We bet it's not and she just wants to hog it all. Happy Easter to you and your Mum too! That is beautiful art. Happy easter to you to and your mom. Just look at all of those beautifully decorated Easter Eggs! You sure are lovely today. That's a great Easter photo! Our mom doesn't have any chocolate for Easter, but she has some delicious shortbread from the local bakery that uses all local, all organic ingredients. She says they are very yummy! I just love this festive picture of you, Athena. So bright and happy! And, I hope your mom enjoys her Easter goody tomorrow! Purrs, and happy Easter! Happy Easter to you! No choco here. TW bought cannoli! You look very bootyful Athena. Happy Easter to ya'll. Your Easter artwork is just lovely and that chocolate looks yummy!!! Very pretty picture of you!! Happy Easter. Your eyes are as beautiful as any of the eggs on your card.